It's heavy. It's flexible. It works! Buy by the pallet and save! 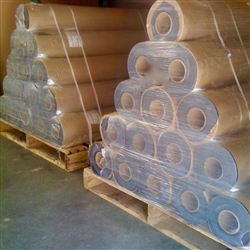 SoundAway Barrier MLV 1# Rolls, 1/8" x 4' x 25', 15 rolls per pallet, are a dense, 1 pound per square foot, flexible, soundproofing mass loaded vinyl noise barrier highly effective in a variety of noise control applications. SoundAway Barrier Rolls offer an effective solution to block voices and reduce noise. SoundAway Barrier is typically installed directly on studs, joists or over a subfloor. To soundproof a wall or ceiling, install your SoundAway noise Barrier leaving about a 1/4" gap around the perimeter of your wall or ceiling. Fill the gap with SoundAway Acoustical Caulk and seal the seams between sheets of your noise barrier with Seam Tape. To enhance the soundproofing quality, install acoustic insulation in the wall or ceiling air space, add a layer of SoundAway Barrier, install SoundAway Sound Isolation Clips, finish with sheetrock, Green Glue and sheetrock.